that enables us to view shared DNA segments. 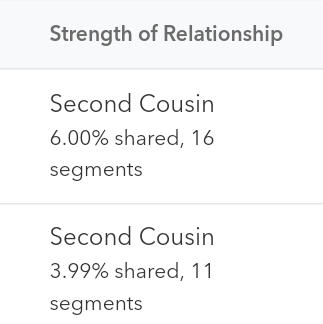 In FEBRUARY 2017 Bridget* gained a new close match at 23andMe. Bonnie* is an adoptee born 17 years later in 1974 in the Albany, NY** area where Bridget's Italian paternal family lived. 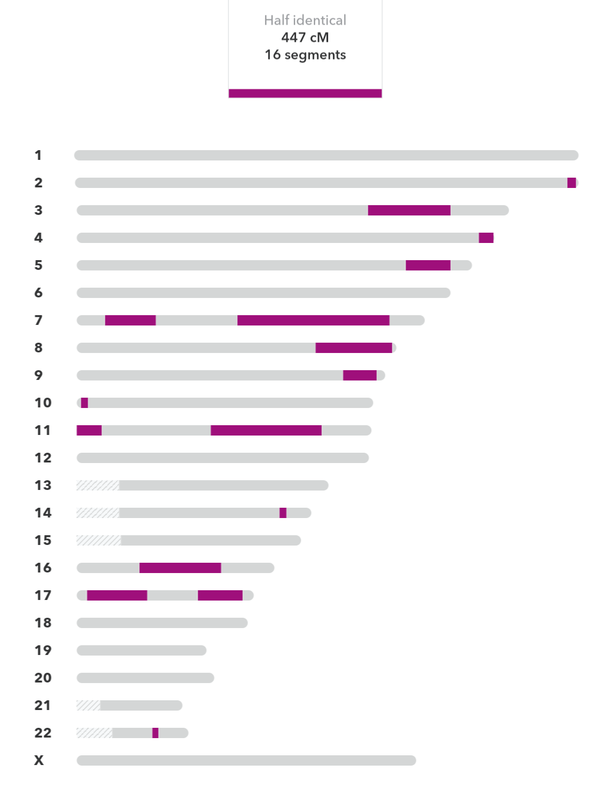 Based on autosomal DNA statistics and other factors including ages, the most likely relationship for their shared DNA amount of 447 centiMorgans (cM) was a first cousin once removed (a child of one of Bridget's first cousins) or another half grand-niece (a grandchild of one of Bridget's half-siblings). Apart from Bridget, Bonnie only had one other close match at 23andMe sharing 297 cM who has a very common name and did not provide enough information to identify his ancestors. At Bridget's request I invited Bonnie to view the paternal research tree I had made for Bridget's search, as that seemed to be the side they were related on. I asked that Bonnie contact me directly for any further assistance, as helping people search for biological family via third parties has not always worked out well for me in the past. (I need to hear from them that they are ready to search. I also need to know they will obtain and share all the information they are legally entitled to, and whether anyone else is helping them, to avoid unnecessary effort.) In the meantime, I started to help identify the biological ancestry of several other people with unknown ancestry who tested and showed up in Bridget's match lists, which have to date included another adoptee and two children of deceased adoptees. her non-identifying information and matches. 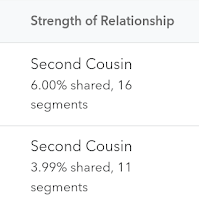 Her 23andMe Ancestry Composition corroborates her maternal grandmother's French (25.1% French & German component) and Polish (3.0% Eastern European component) ancestry. 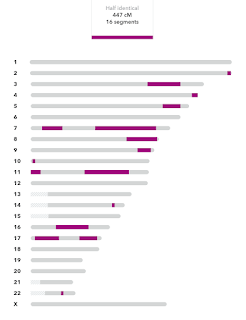 I concluded that she probably had at most one Italian grandparent, with the Southern European component lying between the 14.5% explicitly assigned to that region and 26.4% if one includes the Broadly European component (14.5%+11.9%). The rest of her ancestry, from at least two grandparents, appeared to be predominantly Northwestern European. Bonnie had very few matches corroborating her French, Polish, and Italian ancestry, which is not unusual in respect of recent immigrant ancestry. The majority of her matches, including her mystery second closest match, appeared to have southern colonial ancestry. Meanwhile, back at the ranch GEDmatch, I checked that Bonnie's parents were not related (no indication thereof, good to know) and ran one to one autosomal and X-DNA comparisons between Grace and Bridget and Grace and Bonnie (GEDmatch enabled me to view shared segments in a chromosome browser which AncestryDNA does not, and to compare raw data across testing databases). That threw a spanner (or monkey wrench) in the works. **New York is currently a closed state for adoption records.